Look at my desk; it’s pattern-writing time.I actually got the whole morning to write up a new pattern yesterday, and didn’t dye any yarn until after lunch. 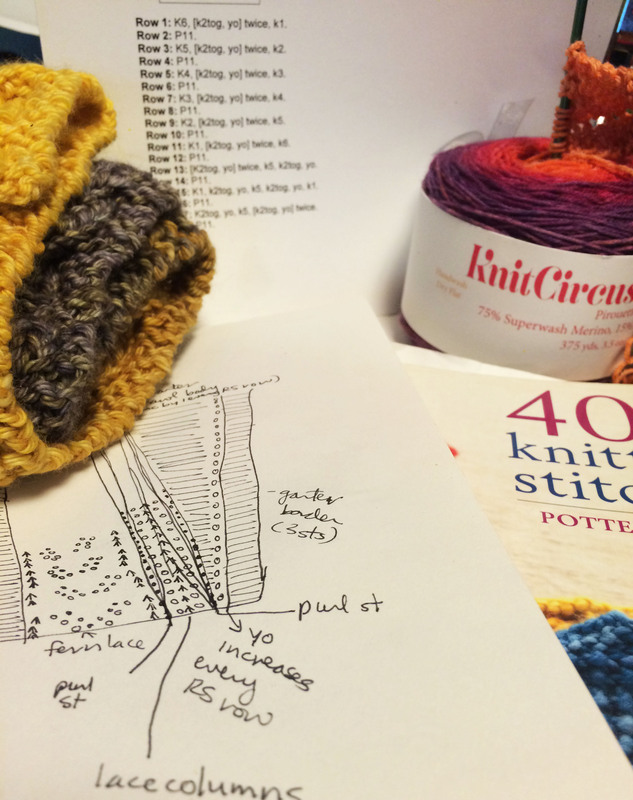 We’ve been very busy in the Lair, with a new shipment going out to Fiddlehead Yarns, (celebrating their 35th anniversary) and a big trunk show headed to Knitche, so this was very unusual! It made me remember how much I love designing. Of course, I love dyeing, too, but I didn’t realize I had several ideas for patterns pent up that were just waiting for a chance to get on the computer. 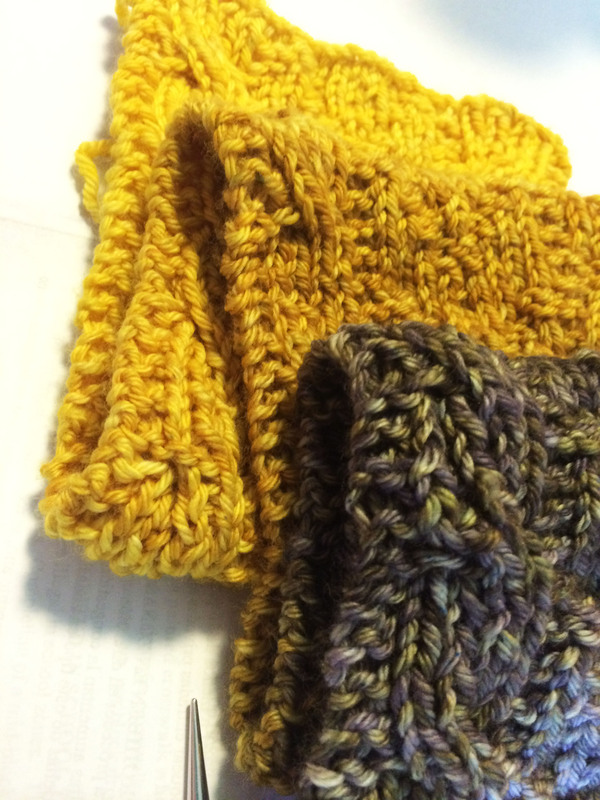 You Gradient Club members will have your last pacages, with one of my patterns, in the mail next week. As we rev up for Fall Knitting Season, I’ll be rolling out a number of fun patterns for you, starting with this almost-finished Brass and Steam scarf. 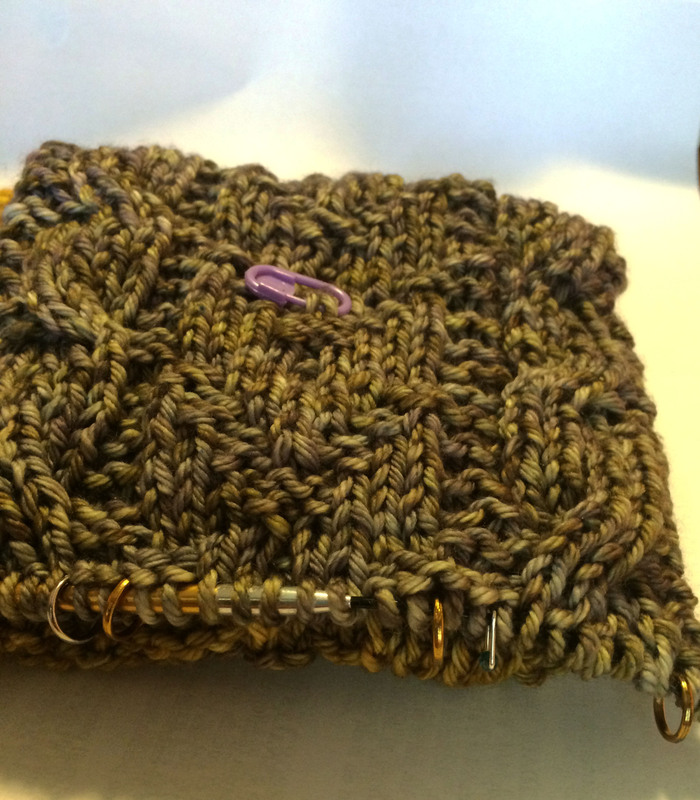 With a combination of textures and cables, it works up quickly with either one or two skeins of Ringmaster Worsted. After working with a lot of lace lately, I really enjoyed knitting this one up, and there’s just one more color change left in my version of the scarf. We just need another round of testing, then this baby will be ready to go to warm up some people this fall! And now, since I’ve got this on the needles, I’d like to talk about one of my favorite little knitting helpers, Stitch Markers! 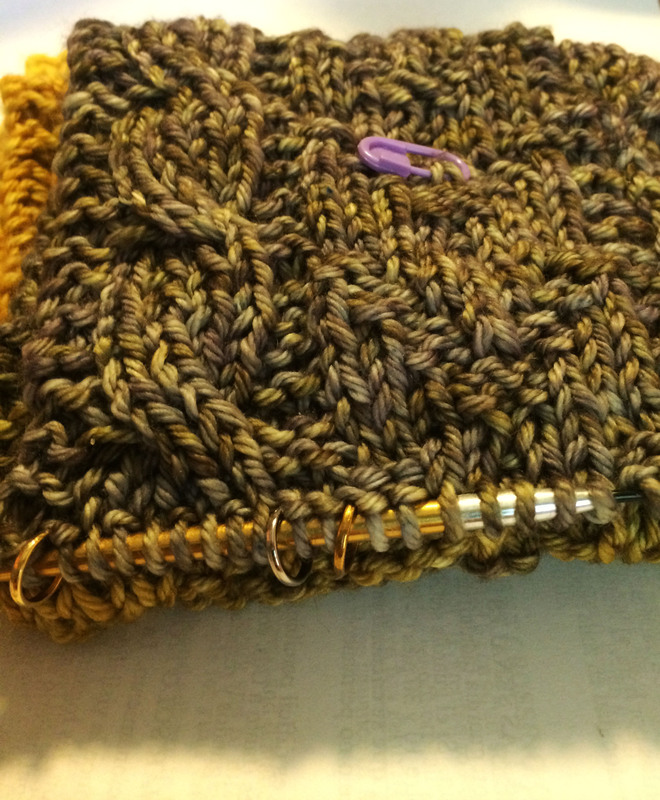 I’m a big fan of the locking stitch makers (“safety pin”) type; you can find Clover ones just about anywhere. I found this purple one above on Etsy, but honestly, this model only has a few good clips in it, then it breaks. Anyhow, I’m using the purple maker above to tell me which is the right side, in this case, the side where I’ll be making my cable crossings. This particular pattern is reversible, so it can be tricky to tell which side is which. You can also see the round, brass-colored markers pretty often along the needles. (These came from the Knitting Tree, but if you want to find something similar online, I love the ones with little beads from Velvet Hippo). I have them placed any time I’m switching from one texture or cable pattern to another, so sometimes there are only two stitches between them! I used to think it was cooler to just keep it all in my head, but then I found myself with textures spilling onto each other’s spaces, and then when I ripped it back, I didn’t feel cool at all. When I’m doing lace knitting, I place them between every single lace repeat, even if it’s only five stitches wide, and always after the side borders, even if they’re three garter stitches and you do the same thing EVERY ROW. Somehow, I seem to be able to mess that up when interruptions come my way…. These little beauties have saved me tons of time re-knitting. Thank you, my little marker friends! My kids go to different schools , so Belle has already been back in class for a week, while Lil Buddy still has a few days of freedom left! 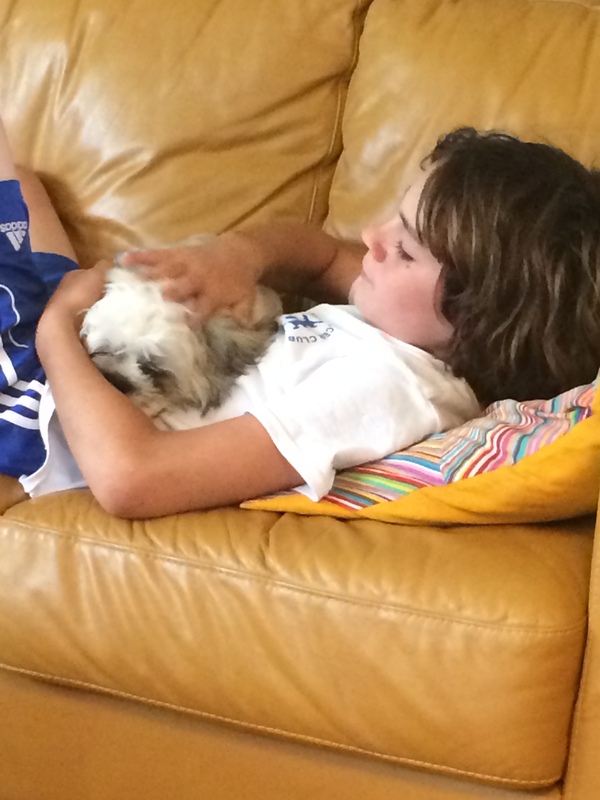 Soccer has started back up, which he loves, and of course, that leaves plenty of time to cuddle Sasha. Looks like it’ll be nice and cool here this weekend, so I’m looking froward to doing some yardwork, hanging with the kids (maybe a Devil’s Lake day trip?) and hopefully finishing my Brass and Steam scarf!